Tell me if you’ve heard this one before: an unassuming character is given the task to use a magical item to destroy a great evil that once terrorized the world. To help this character on their quest is their best friend, a magic-wielding individual, a ranger with a love interest, a dwarf, and some elves. Look, I get that The Lord of the Rings redefined the fantasy genre in the 1950’s, but why were fantasy writers still replicating this formula twenty years later? I only half-paid attention to this derivative plot, mostly because I already had an idea what was going to happen. 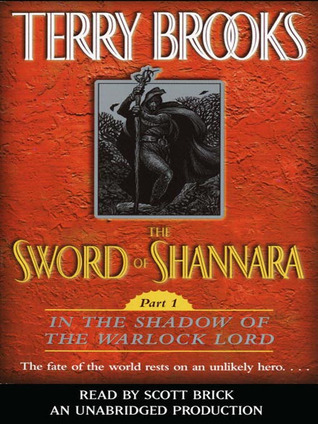 Now, I will admit that The Sword of Shannara isn’t completely a 1-for-1 rehashing of The Lord of the Rings, but enough of it is similar that it feels almost too familiar. The plot does divert from the Tolkien formula, but probably not until about halfway through. It was at this point where some interesting and original characters finally arrived on the scene. A mute rock troll and his thieving friend were quite entertaining, and I would almost prefer if the story was about them instead of about this titular and fabled sword of legend. Just enough of this book was different enough to make it engaging. Sure, some of the same Lord of the Rings plot points were there, albeit in a different order, but the details were just unique enough to give the characters their own little side quests. I know it ‘s hard to introduce an entire fantasy world in one book, so I’m willing to give this trilogy a bit of slack, but only as long as the next book in the series goes in a new and original direction and doesn’t just follow the Lord of the Rings template. Moments of originality in a mostly derivative plot, I give The Sword of Shannara 2.5 stars out of 5.